There’s no better way to show how much you appreciate your father (or a father figure in your life) than surprising them with an awesome subscription box gift! Whether if they love craft beer and candy or clothes and BBQ essentials, there’s a great subscription box for that! Below, you’ll discover some of our favorite Father’s Day subscription boxes. Here are the best subscription boxes that are perfect for Father’s Day. Plus, you’ll even discover some pretty killer deals, discounts, and coupons to make these monthly gift boxes even more affordable! What it costs: $45 a month. What you get: Get a thoughtful collection of goods from small-batch brands such as cocktail kits, apparel, bags, electronics, grooming items, and other lifestyle products. What it costs: It’s free to join Winc while wine starts at $13 a bottle. What you get: When you answer 6 quick questions about the flavors you love and your favorite tastes, you’ll get a curated selection of wines based on your ballets delivered straight to your door. By far one of best wine clubs out there today! Coupon / Buy Now: Get $20 off your order HERE. What it costs: $42 a month. What you get: When you join Craft Beer Club, you’ll get shipments of some of the best, most exceptional small batch craft beers from across the country. What you get: When you gift a Say it With a Sock box this Father’s Day, they’ll receive fun, stylish, and bold name brand name socks delivered monthly. Plus, you’ll even get this corny pair for free! Coupon / Buy Now: Use the code URBANTASTEBUD get to get $2 off HERE. What it costs: $20 a month. What you get: Each month, you’ll receive a box of high-quality shaving and grooming products eery month based on your skin and grooming routine. Inside, you’ll find 4 grooming products and 1 full-sized product like a shirt, boxers, sunglasses, and more. Coupon / Buy Now: Use the code DADSDAY20 to get 20% off HERE. What it costs: $26.99 a gift box. What you get: Inside of each Loot Crate, you’ll find a curated collection of awesome fandom items like collectibles, apparel, comics, accessories, and much more. Plus best of all, each month features a different fandom including any recent Star Wars, Marvel, or DC movies, and more. Coupon / Buy Now: Get your box HERE. What it costs: $25, $91, or $275 a month. What you get: Get a new watch from a great brand every month. Best of all, depending on what price level you’re subscribe to, a random winner can win a Rolex every Friday or a Tag Heuer every Tuesday. Coupon / Buy Now: Use the code pj-20taste to get 20% off HERE. What it costs: $28 a month. What you get: Get 3-4 bags of delicious, gourmet, artisan jerky based on your favorite flavors and spices straight from some of the best artisan jerky makers in the nation. Coupon / Buy Now: Use the code URBANTASTEBUD12 to get $12 off HERE. What it costs: $54.94 for 2 meals with the person plan every week or $139.84 for the family plan. What you get: When you subscribe to Blue Apron, you’ll get a meal box of original, seasonal, and crazy fresh pre-measured ingredients as well as recipes curated by renowned guest chefs as well as Blue Apron’s culinary team. What it costs: $9 – $49 a box. 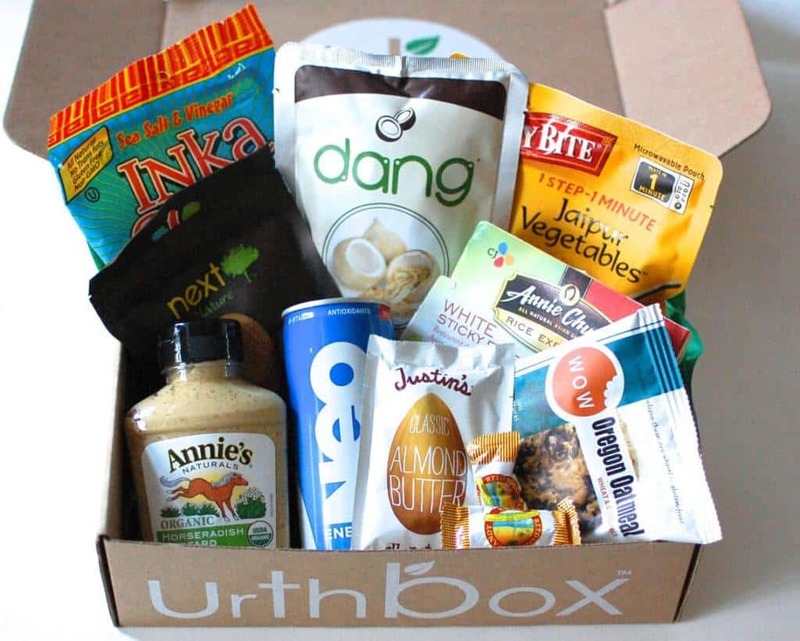 What you get: When you join Urthbox, you’ll get a monthly box of delicious, healthy, and organic snacks delivered straight to your door. Plus, they even have gluten free, vegan, low calorie, and classic boxes. Coupon / Buy Now: Use the code Urbatastebud to get $10 off your box HERE. What it costs: $26 a box. What you get: With a Blue Bottle Coffee gift subscription, you’ll get their deliciously famous whole bean coffee blends delivered straight to your home. What it costs: $60 a month. What you get: When you sign up for Menlo Club (previously Five Four Club), you’ll get a curated package of 3 clothing items based on your style preferences and favorite colors. Coupon / Buy Now: Get 50% off when you join HERE. What you get: Sprezzabox is the perfect box for anyone looking for great fashion accessories like belts, ties, sunglasses and more. Each box contains 5-6 items that your dad is gonna love. Coupon / Buy Now: Get the box HERE. What it costs: $9.99 a month. What you get: With Book of the Month Club, you’ll get interesting books based on your favorite genres delivered monthly. Coupon / Buy Now: Join the club today for only $5 HERE. What it costs: $19.99 – $27.99 a month. What you get: When you join Candy Club, you’ll receive a box of amazing, insanely delicious candies and treats delivered straight to your door every month. There’s no better way to put a smile on your father’s face than with this box. I guarantee it. Coupon / Buy Now: Get $15 off your first candy box HERE. What it costs: $34 – $79 a month. What you get: You know those insanely delicious looking foods from restaurants across the nation that you see on Food Network (like Diners, Drive Ins and Dives) as well as those videos on Facebook? Well a subscription to Goldbely basically jtakes you to these places without actually having to leave your home. To get started, just choose from popular pie, sandwich, burger, BBQ, pizza, bacon, ice cream, cooke, and cake subscriptions! What it costs: $12 a month for 1 pair or $19 a month for 2. Coupon / Buy Now: Use the code FATHER10 to get 10% plus an extra free pair of socks HERE. What it costs: $24.99 a month. What you get: With a BBQ Box subscription, your dad will get awesome barbecue sauces and rubs hand selected my Myron Mixon each month. What it costs: $38 a month. What you get: Each month with Gainzbox, you’ll get awesome Crossfit and workout gear delivered monthly. Coupon / Buy Now: Use the code GZ10 to save 15% on your box HERE. What you get: When you join this cool sports subscription box, you’ll get a box of 5-7 sport specific items that you can’t find anywhere else like team apparel, collectibles, gears, and memorabilia. Just choose your favorite team and you’ll get a box during the MLB season (5 crates between May and September). Thanks for reading and hopefully you find the best Father’s Day subscription box that’s perfect for your father, grandfather, mother, or anyone that you look up to this holiday. Looking for more gift box ideas? Check out our favorite boxes for every type of person!